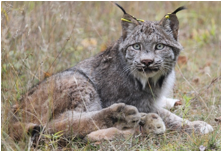 Moose, Ruffed Grouse, Waterfowl, Bear, Deer, Canada Lynx are just some of the wildlife that you could spot on your adventure through the Maine wilderness. Bring your camera to capture it. As humans, we do a lot of tinkering with our ecosystems – sometimes on purpose and sometimes by accident. These ecosystems and the natural resources that define them are a source of nourishment for our own species and a major part of our life support system.. The living parts of these systems are various plant and animal species. The big wildlife species, like moose and bear, are easy to identify as parts of our local wildlife fauna. The smaller invertebrates and microfauna in soils, water, and air also play crucial roles in ecosystem processes and functioning. Some of the services they provide include nutrient cycling, soil aeration, water purification, and pollination – they also feed the larger species. All species are “cogs and wheels” in our life support system, and as one can imagine, they often can be hard to track. Maine is well known for its wildlife. Our state has one of the biggest moose and black bear populations in the “Lower 48”. Bear and moose, along with white-tailed deer are arguably the most sought after mammals for viewing and hunting. However, smaller mammals such as beaver are also very popular with tourists. Birds belong to the class of animals referred to as Aves. Birds have feathers, have wings, are warm-blooded, and lay hard-shelled eggs. All birds have a beak with no teeth, a four chambered heart, and a lightweight but strong skeleton. Birds have unique digestive and respiratory systems that are highly adapted for flight. Most birds communicate using visual cues and through calls and songs, and many species are highly social. Some birds, especially the corvids (crows, ravens and blue jays among others) are amongst the most intelligent animal species. Many of Maine’s 292 species of birds occur statewide in suitable habitat, but others occur only in portions of the state. Many of Maine’s bird species undertake long distance migrations (i.e. shorebirds) and others undertake only short, somewhat irregular seasonal movements. Some species, like the ruffed grouse or wild turkey, are year-round residents of Maine with home ranges that are relatively small. Maine has a very diverse landscape and consequently a myriad of habitats suitable for various bird species. At least 29 inland breeding species of birds reach the northern limits of their breeding distribution in Maine, 28 species the southern limits, and 2 species their eastern limits. In addition, many of Maine’s island-nesting seabirds reach their southern breeding terminus on Maine’s islands, like Atlantic puffins and razorbills. The peregrine falcon and wild turkey have been reintroduced in Maine. Today, the peregrine population is slowly increasing, and the wild turkey has expanded into areas beyond our expectations. Other species, such as the turkey vulture, blue-winged warbler, evening grosbeak, American oystercatcher, great cormorant and sandhill crane and several species of wading birds, have expanded their breeding range into Maine at various times over the past century. Read more about Maine wildlife here.